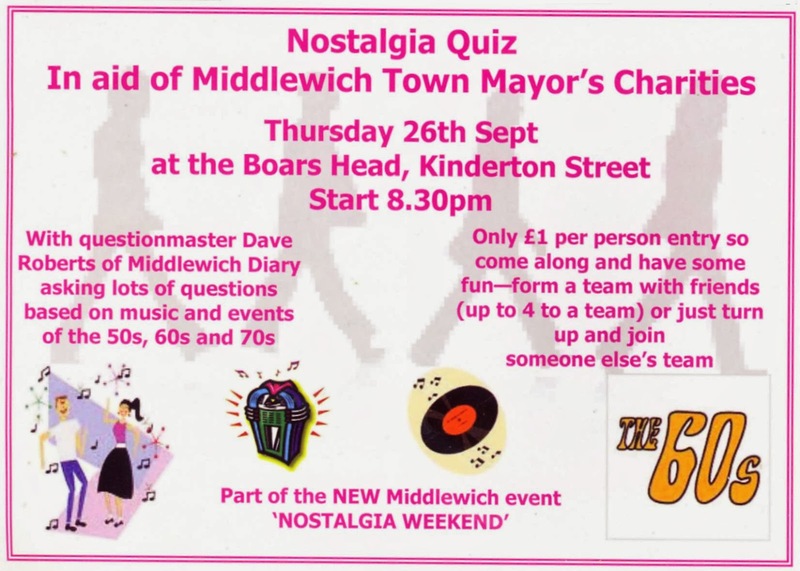 The Nostalgia Quiz was designed simply to get the Middlewich Nostalgia Weekend off to a flying start, and to raise a little bit more money for the Mayor's Charities. There were rounds on: Music of the 50s, Music of the 60s, Music of the 70s, 'Bits & Pieces' (mystery voices, vintage TV and radio programmes and ads etc), 'Dead or Alive' (famous people of the 50s-70s - are they dead or alive?) and a picture round featuring celebrities of the 50s, 60s and 70s. The Quiz was compiled and presented by Dave Roberts and administration and scoring was by Peter Cox. Details of the teams and winners, along with some of the questions (and answers) will be posted here in due course. Great evening last night at the Boar's Head for the Nostalgia Quiz. Great fun and we raised over £50 for the Mayor's Charities. Thanks to Dave Roberts and Peter Cox for organising such an entertaining quiz, and to everyone who supported it.